Diptych canvas prints. Design your own diptych prints. Bring a contemporary, gallery feel to your photographs with our diptych prints. Display your artwork or photo memories across 2 piece canvases to bring the designs to life and add a stylish quality to your pictures. The perfect decorative addition to your home or if you want to dazzle at an art exhibition. Diptych canvases are a stunning way to display one image and make a statement, or to share multiple photos across two canvases. Your designs will be reproduced using the highest quality materials and superior printing methods, presented on hand-crafted wooden frames. With everything being made onsite in the UK, we’re so confident in the high quality of our 2 piece canvas prints that we offer a lifetime guarantee with every order. Our sublimation printing process gives you a vibrant and bright print with incredible detail and sharp imagery. Printed on genuine woven canvas with slight grain, this gives your diptych canvases a contemporary look with a soft matt finish. Your stunning design is then stretched over hand-crafted FSC certified wooden frames which are handmade in our London factory. Create your diptych print with our online design tool which allows you to easily view and edit your images. With full control of your design, you can create a beautiful print and even add text or photo montage options with shaped frames. With a flexible range of diptych prints sizes, you can choose the perfect style and size to suit your design. Available in sizes from 2 lots of 30 x 30 cm canvases to 2 lots of 140 x 140 cm canvases. Each set of diptych prints comes in a depth of 2.5 cm, lightweight yet sturdy enough to hang and position on a wall of your choosing. Your photographs will be displayed on a genuine woven canvas, made of 100% poly. Unlike its cotton counterpart, this fabric won’t weaken over time. The surface has an even, gentle grain texture without imperfections to create a professional quality finish. Our makers create every canvas frame onsite in the UK, allowing for the highest quality products. Each frame is made using FSC certified pinewood which has been laminated to prevent cracking or warping over time. Our premium wood gives your design a sleek and modern finish, as well as preserving your print well into the future. We use 8 stretcher wedges over the typical 4, to give your diptych canvases the perfect canvas tension which can be adjusted if necessary. We use a sublimation printing process across all our prints, where heat and pressure are used to lock the inks into the fibres of the canvas. This ensures the print is durable, long-lasting, washable and completely scratch proof – all without a shiny plastic coating laying on top. Expect a beautifully vibrant and robust print, with an even tone. Alongside our sustainable wood, our dying inks are also environmentally friendly to help reduce our carbon footprint. We take an eco-friendly approach to creating our products whilst ensuring we never skimp on quality. To keep the colours of your print rich and fresh, keep the panels out of direct sunlight. Your choice of canvas wrap – the edges of the canvas – can enhance your design. To make sure you don’t lose any important details of your 2 panel canvases, check our design tips below. A mirror wrap is automatically added to diptych canvases where your image is reflected over the canvas edges, but other options are available. Choose from a gallery wrap where your image extends over the edges, a coloured wrap for chic coloured edges, or simply no wrap. Whether you want to hang your diptych canvas prints in your home or in an art gallery, it’s simple with our free wall-hanging kit. Each kit comes with picture hooks, wall plugs and screws to hang your work with ease. 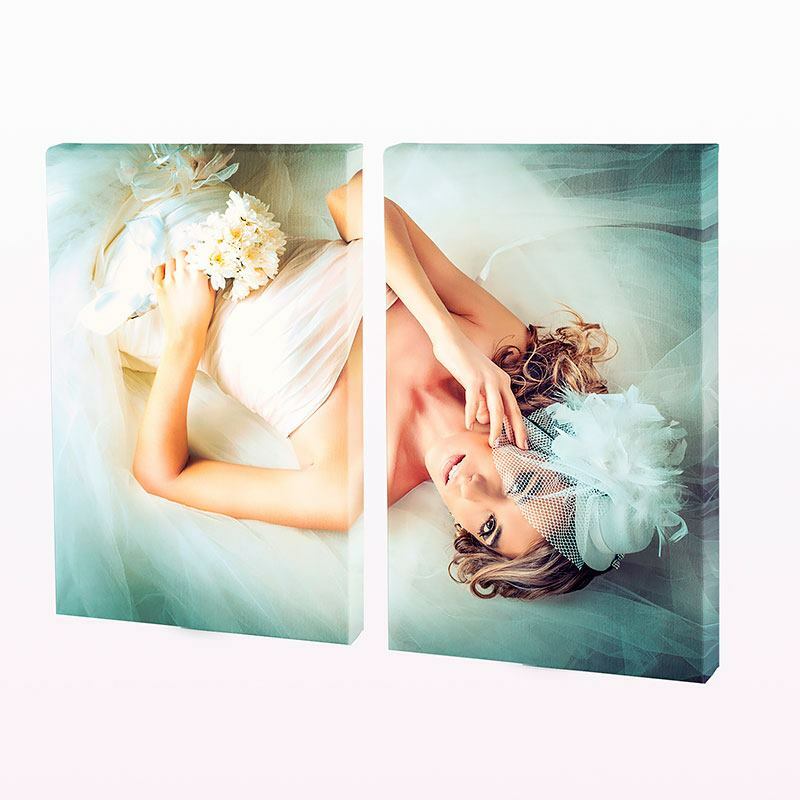 Choose a wrap that will suit your design to create the best quality diptych canvas print. If your image has important details such as people near the canvas edges choosing a simple coloured wrap is a great idea. For this option, place your image on the canvas template and then choose the coloured selection. Note that if there is a large area of white in your 2-panel canvases, you may be able to view the stretcher bars through the material. The bleed is the area we use as leeway for the printing process. The bleed may be visible on your final diptych canvas so make sure to fill it with your image, however, placing any important details in this area means that they likely will be cut off. Create an impact on any wall with a 2 canvas print. A diptych canvas is ideal for showing two images from an important event, for example, two shots from a wedding showing the bride and groom about to get married, and then showing them embracing once the ceremony is completed. A diptych print looks particularly effective with scenery photography, split over the two panels. This creates a sprawling effect and draws viewers in. Be careful not to place faces, text or important parts of the image between joins, as this could result in losing details in the sides of the panels. Add a pop of colour to a room with a series of diptych canvases on chic, white walls. Choose a vibrant abstract print or a lively family photo in your living room to create a warm and fun atmosphere! Why not create a photo montage collage so you can share multiple photos on your 2 piece prints? Using our online design tool you can choose our pre-set montage options which will automatically arrange your images in various shapes, or you can arrange them yourself for full creative control. 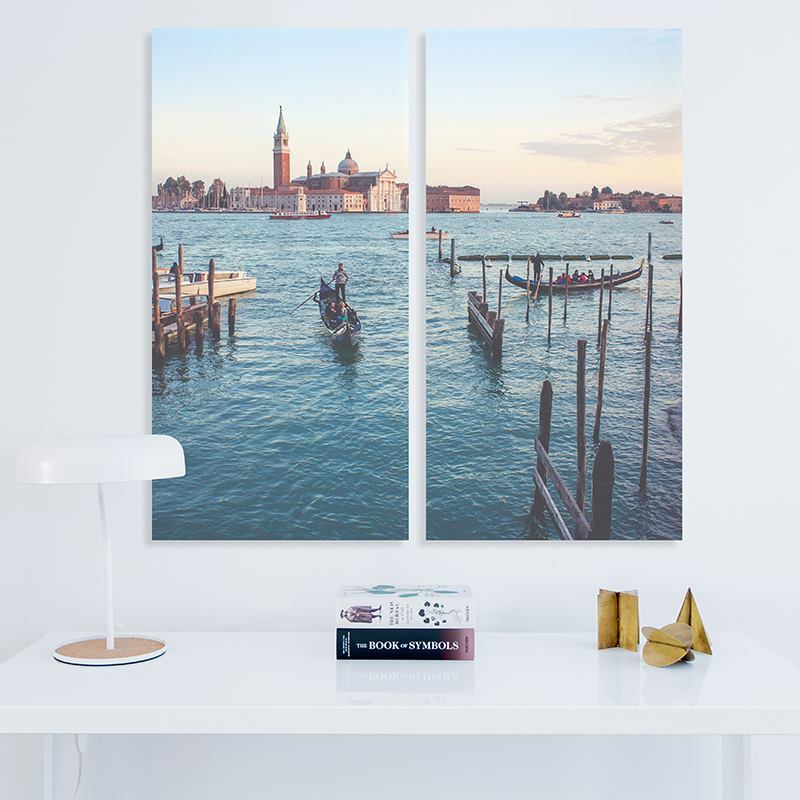 Deck out your home with your designs by taking advantage of our 3 for 2 offer on diptych canvas prints, and add some unique artwork to your living spaces. The discount will automatically be applied to your basket. We want all our customers to remain happy with their purchases well into the future, so we offer a lifetime guarantee with every order.